It’s super cool, sure, but Virginia taxpayers are paying for it. Amazon’s deal to create one of its two new HQ2 sites in Arlington calls for the state to spend close to $200 million on sustainable transportation improvements to make life better for 25,000 new workers. [PDF] That’s in addition to the nearly half a billion Arlington and the state had already been pouring into transportation infrastructure in this area. The state’s promised investment is a markedly different approach than New York City and State officials used to lure the retail giant — forcing Amazon to set aside half of its estimated $30 million in property tax payments for a city-controlled “infrastructure fund.” True, transit advocates say that far more money is needed to mitigate the impact of Amazon’s Long Island City HQ2, but at least it will provide some privately funded relief for Queens commuters. In Virginia, the Amazon deal means a new life for the most eye-catching project: a 900-foot pedestrian bridge across the George Washington Parkway and CSXT railroad tracks that will connecting the Crystal City offices to Reagan National Airport. The $30-million pedestrian bridge proposal predates the Amazon bid. The state has also agreed to expand capacity at the nearby Metro stations. The agreement promises Amazon an additional entrance at the Crystal City East as well as at the Potomac Yard Southwest Metro Station (a nearby new Metro infill station set to open in 2021). Virginia set aside $28 million in deferred tax revenues for infrastructure projects but that amount won’t cover the total costs. The second entrance at the Crystal City Metro station alone is reported to cost $78 million. Metro is reportedly seeking state funding. The deal also entitles Amazon to “mutually agreed upon improvements to Route 1,” a wide, high-speed road that runs through Crystal City. Right now the road is a nightmare for pedestrians. 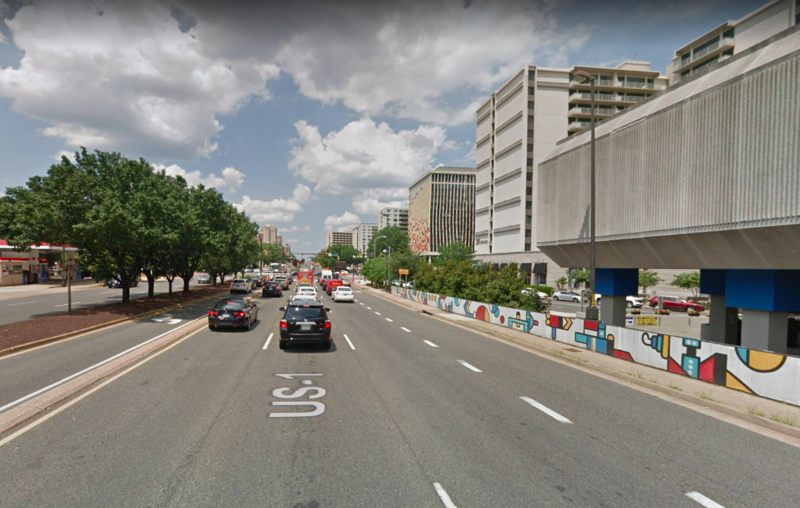 Chris Slatt of Arlington County’s Transportation Commission wrote on Greater Greater Washington that the road would be converted into an “urban boulevard” at a cost of $250 million as part of the deal. That’s a nice chunk of change, but it will help make the area much more walkable and pleasant. In addition, the agreement also calls for the expansion of the Crystal City/Potomac Yard Metroway bus rapid transit, which runs buses on partially dedicated lanes from Crystal City to the Pentagon and northern Alexandria. Sustainable transportation advocates like Stewart Schwartz, executive director of the Coalition for Smarter Growth, said the proposal looks solid. “Those all look like the investments we need,” Schwartz said. Amazon’s expansion into the region could open the door to more ambitious projects, in the future as well, said Davis. In addition, the region could explore linking Maryland Commuter Rail, MARC, to the area through D.C., he said, potentially with the cooperation of the state of Maryland, but that would be a complicated long-term process. Good transit and a highly educated workforce make sense — but couldn't Amazon have spread the wealth instead of picking suburbs where it already has a large presence? Is Houston Serious About Becoming a Multi-Modal City?